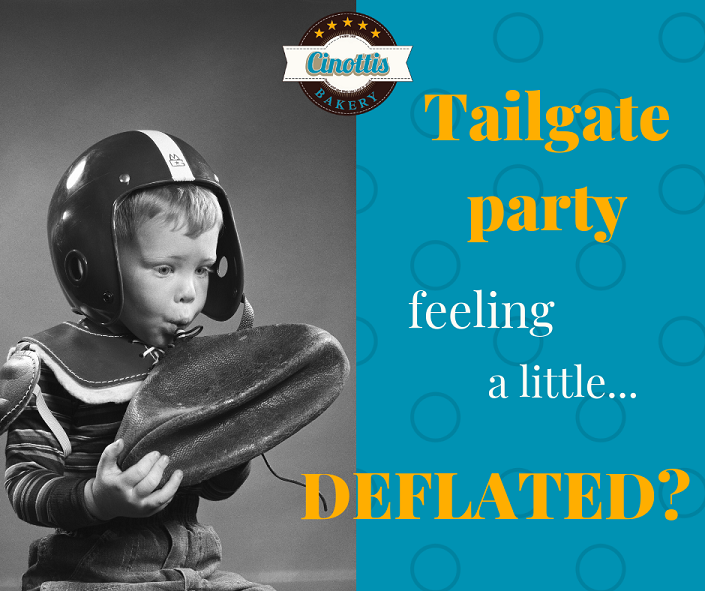 Tailgate Party Feeling Deflated? Try theese Football Favorites! Tailgate party season has kicked off for both college and Jaguar football, and that means weekend parties family and friends! Aside from wearing your favorite Jags jersey you also need plenty of food to keep the party going. While we can’t help how our team plays on the field, we can certainly make your tailgate party a winner. Before you order foods and treats from multiple restaurants around town, check out our tailgate selections. It may be just what our boys need to turn the game around. Our sandwich trays are made fresh to order. Each tray includes a selection of freshly sliced deli meats from Thumann’s, including smoked ham, roasted turkey, and slow cooked roast beef. In addition to these three premium meats, some sandwiches will also include our homemade chicken salad. To keep your sandwiches from getting soggy throughout the game, we provide condiments on the side. Not keen on some of these meat choices? Not a problem at all. We can certainly customize your sandwich tray to fit your needs. Simply let our sales team know when placing your order, and we’ll take care of the rest. Okay, massive may be a bit of an exaggeration, but this two-foot long House sub is rather impressive. With two layers of Genoa salami and smoked ham, we then add a generous layer of Provolone cheese. Topped with freshly shredded lettuce, sliced tomatoes, onions, and green bell peppers, this sub is a sight to see. Creamy Italian dressing can be served on the side to keep this beast from getting soggy. If you’re serving more than 12 guests or if you want really big servings, it may be best to order more than one. Chicken wings and football go together like cheese and pizza. Most people favor the drumstick which is why we offer a tray full of them. These golden drummies of goodness come with a side of our famous homemade ranch dressing too. You can also request additional dipping sauces such as our homemade honey mustard or barbeque. While a fruit or vegetable tray may not be the first thing you think of when you hear ‘tailgate party’ it may be something to consider… at least for a minute. With the heavy foods and drinks your guests will be consuming, a little bit of fresh fruit or vegetable may in fact be helpful as the afternoon wears on. The refreshing tastes and textures can revitalize you and your guests so you can kick the party up a notch. Our fruit trays offer a minimum of five in-season fruit options including grapes, pineapple, cantaloupe, honeydew, oranges, blueberries, and strawberries. You can serve it as is or add a side dish of whipped cream or flavored fruit dip. Tray selections vary based on what’s in season but often includes carrots, celery, broccoli, and grape tomatoes. Chips and dips are essential tailgating must-haves. That’s why we offer our Buffalo Chicken and our Spinach dips for your tailgating party. What makes our dips special is that they are made right here in Jacksonville Beach with ingredients you can trust…and pronounce. Buffalo Chicken Dip is made of shredded white meat chicken, cream cheese, shredded cheddar cheese, and Frank’s buffalo sauce. An order of this mildly spicy dip includes a package of our homemade melba toast. Spinach Dip is made of spinach, artichokes, sour cream, cream cheese, parmesan cheese, and special seasonings… it’s John’s secret. He won’t tell. Like it’s spicy counterpart, this dip is served with a package of our melba toast. Both Dips can be served warm or cold. With many more tailgating food options available, it’s hard to list them all in one setting. We encourage you to check out our social media pages for the latest and tastiest foods for you and your guests. Knowing the nutritional benefits salads offer pushes you to want to eat them more often. But finding a salad you’ll actually like to eat every day can be difficult. Even if you find one you do like, eating the same old salad day in and day out can become boring. To help win the battle of boring salads, we’ve created four tasty salads that will energize your salad routine and keep you on a healthy eating track. No need to don your boots and spurs for this meal. Our southwest salad is tame enough for any one. Atop a bed of fresh romaine and spring mix, this salad boasts a generous portion of grilled southwest style chicken and grilled corn. 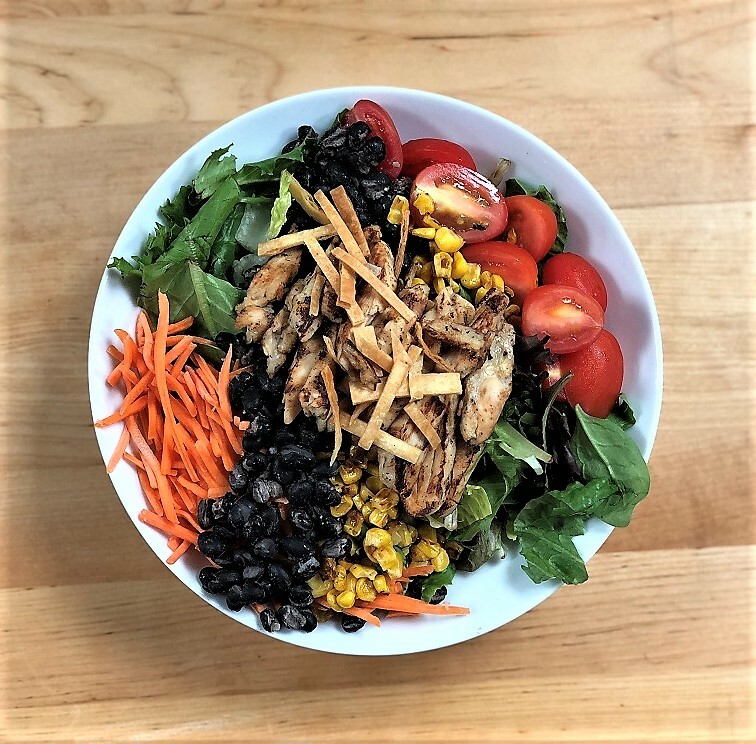 Shredded cheese and black beans combined with sliced grape tomatoes and carrots, our southwest salad has enough power to quell even the hungriest of appetites. Looking for more southwestern attitude? Kick this salad up with our homemade jalapeño ranch dressing. The flavors and textures combine to create a fiesta in your mouth. With flavors bursting in every bite, this makes the list of salads you’ll actually like to eat rather than have to eat. Caesar salad can be a hit or miss item in any deli or restaurant. Thankfully, ours is always a homerun. 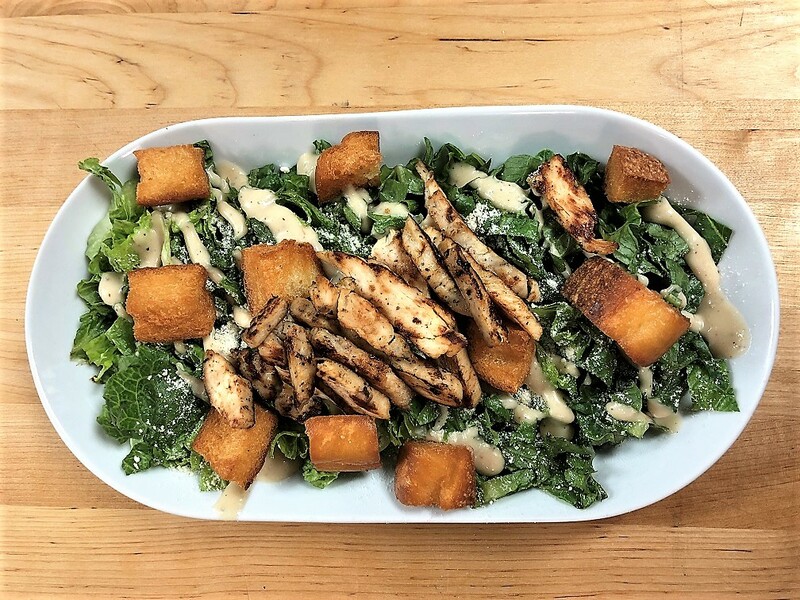 Served on a bed of freshly chopped romaine lettuce, our Caesar salad is topped with grilled chicken, homemade croutons, and parmesan cheese. If you’re wanting a bit more texture, substitute fried chicken strips instead. And since our Caesar dressing is served on the side, there’s no need to worry about us drenching your salad in too much dressing. With a balanced blend of romaine lettuce and spring mix, our chef salad is full of nutrients. Fresh cucumbers, tomatoes, and carrots increase the health factor as well. 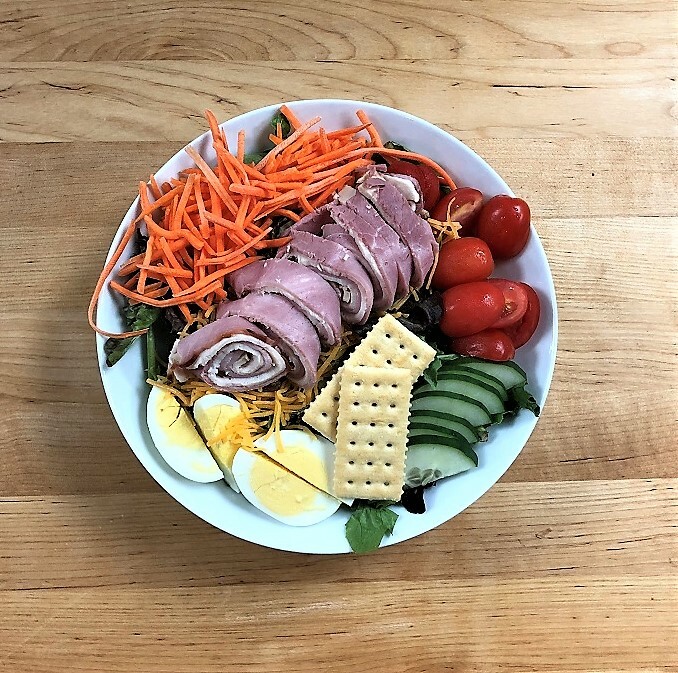 And with the addition of ham and turkey rolls as well as protein rich boiled eggs, this salad will keep you full for a while. If you’re in the mood for grilled or fried chicken on your salad, we’re happy to swap out the proteins. Top this one off with one of our many dressing choices to create daily salads you’ll actually like to eat at every meal. As a tasty twist in conventional salads, our salad plate offers a mixed variety of flavors. 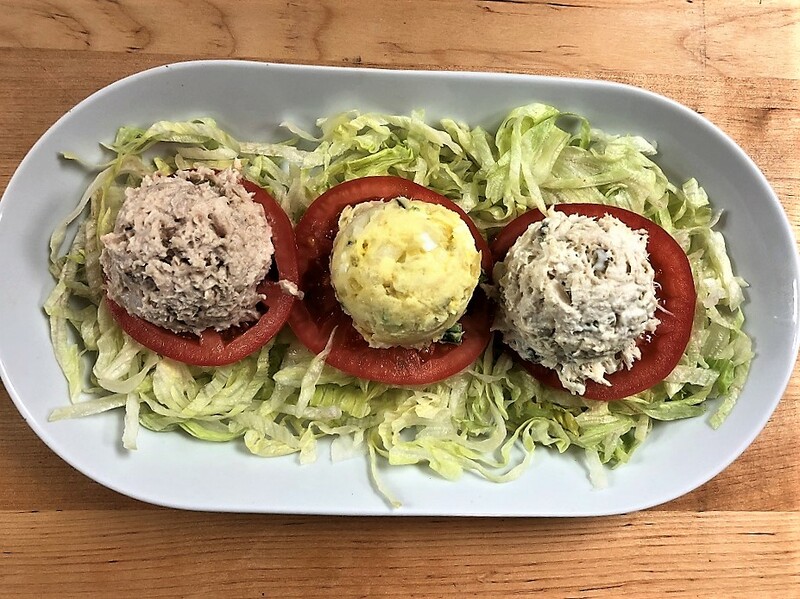 On a bed of shredded iceberg lettuce and sliced whole tomatoes, we pile three whopping scoops of salads of your choice. Choose from one of our originals such as chicken salad, tuna, egg salad, potato, pasta, and macaroni. The best part of this menu item is the ability to customize it to your own liking. If you only want chicken salad, you’ve got it. Two scoops of tuna, one macaroni? Not a problem at all. The diversity our Salad Plate offers allows you to switch up flavors and textures each day. 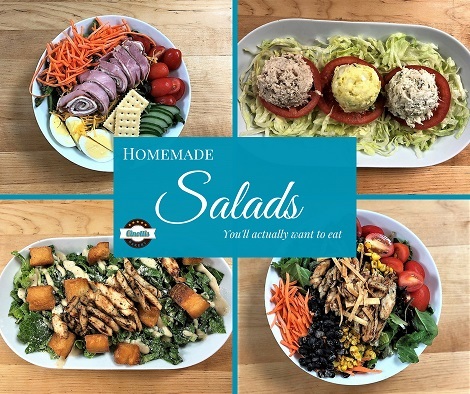 Each salad we offer can be customized to fit your taste and nutritional needs. While some salads are designed to be served with a specific dressing, we’re always happy to accommodate a substitute. Is it possible to create salads you’ll actually like? Most salads are created equal. That’s probably why many people view them as the boringest meal ever! Switching up your salad choices each day is important. Not only will you be eating healthier, you’re taste buds will thank you as well. So if you’re looking for fun, yet healthy (ish) salads you’ll actually like, why not check out one of our fun salads this week. We’re pretty sure you’ll enjoy every bite. We’ve heard it for generations: breakfast is the most important meal of the day. It’s the meal that sets us up for a successful day. And with the school year just starting, it’s the meal that can set our children up for success as well. Here’s why breakfast is so important. Children who eat breakfast everyday are more likely to eat healthier throughout the day. They can make better food choices at school because they aren’t famished when the lunch bell rings. With seven children of our own, we completely understand that every child is ‘always hungry’. But if children learn to set proper eating schedules, they are more likely to carry those healthy habits into adulthood. Eating breakfast boosts concentration, problem solving skills, social interactions, and more. With increased cognitive function, your child’s school performance can increase drastically. Even something as simple as a banana can provide an energy lift to keep your little one going. With the added energy breakfast provides, children will also be more active. We don’t mean bouncing off the walls, driving teachers crazy. We mean good physical activities such as walking down the hall or playing during recess. With consistent physical activities during school, sports, or playtime each child can create great exercise habits that follow them as they grow older. The mental and physical boosts breakfast provides is exactly the reason breakfast is the most important meal of the day. Eating a healthy breakfast everyday can certainly be a struggle. Especially when you have a hard time getting those little guys out of bed. Breakfasts including whole grains, fiber, and protein will keep your child fuller longer as well as aid in meeting their nutrition requirements. A breakfast sandwich with eggs and cheese on whole wheat toast can provide enough nutrients and energy needed for a busy school morning. Grab a blueberry or banana nut muffin while you’re in. The energy these breakfast treats provide will fill their little tummies and put a smile on their sleepy face at the same time. With so much on your to do list each morning, let us take care of making breakfast. Stop in for a bite of from our full line of breakfast pastries. If you have a bit more time, try our freshly prepared breakfast sandwiches. If you’re really in a rush, call and order your food ahead of time. It’s back to school time in and we’re so excited! We love our children. But the day they step foot on school campus and don’t come home for seven hours, is truly a blessing. Seriously though, we’re not just excited about our own children going back to school. What really has us ecstatic is the opportunity to see you and your smiling children before and after school again. We’re here getting everything ready to make this school year better than ever. Breakfast, lunch, school treats, and even after school cookies are just part of what we’ve got planned for you this year. As working parents, we completely understand the morning rush during the school year. In fact, if we didn’t have a kitchen here in the bakery, our kids would probably go to school hungry. Anyway, in an effort to help you and your children have a good breakfast before school, we’re highlighting some of our most popular breakfast items. Our breakfast sandwiches are made with freshly cracked eggs and homemade bread. You can add your choice of meat including ham, turkey, bacon, or sausage. Add cheese if you’d like. We offer American, Swiss, Provolone, and Cheddar. Want some veggies mixed in? We can make that happen as well. If you’re running short on time, give us a call ahead of time. That way, your breakfast sandwich can be hot and ready when you walk through our doors. A donut may not provide the protein that a breakfast sandwich does, but it will provide energy for your child to start their school day. We offer over 20 varieties of donuts on a daily basis. And if we don’t have what your little angel wants, we will do our best to whip one up. Cheese pockets are among our most popular Danish in the morning. And other Danish such as apple or pecan, provide a little more protein as well as energy. Our daily Danish variety includes cherry, blueberry, lemon, and meltaway. Parents, don’t forget your own needs. We have hot coffee brewing all morning long. Do you know we also offer cold sandwiches in the morning? If you’re low on time or even sandwich supplies, we can make your child’s school sandwich while you eat breakfast. Ham and cheese, turkey and cheese, even peanut butter and jelly can all be ready by the time you leave for school. If you call ahead, you’ll have time to pick out a cookie too. For more than 10 years, we’ve created a special menu for high school students and teachers. This menu is designed to be quick, easy, and affordable. This tradition will carry on this year as well. If you’re a student or Fletcher teacher, be sure to ask for the fletcher menu when you come in. Children coming in for after school treats is a wonderful tradition. We love seeing little faces light up at the sight of all the cookies in our case. Cookie varieties vary daily, but you can be sure to see sugar cookies, decorated cookies, or one of our everyday cookies in the case any time you come in. Teachers like apples, but they LOVE cookies even more. 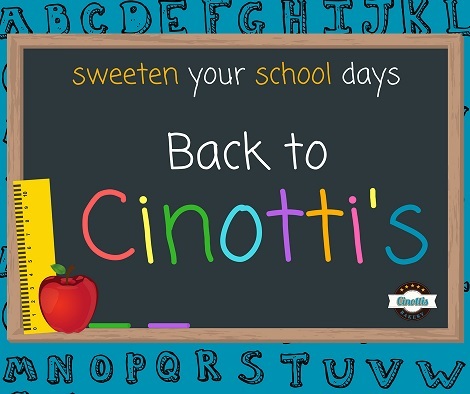 We can’t be 100% sure, but there’s a good chance your child will get a super big smile when they bring a treat from Cinotti’s into the classroom. We’re here for any of your back to school needs. From breakfast and lunch to school treats and gifts, our team is ready to help you in any way. As always, we sincerely thank you for allowing us to be a part of your family traditions. Now, get those babies off to school and come back to get a snack for yourself… You’ve earned it. Carrot cake is perhaps one of the most popular cakes in America. And why not? 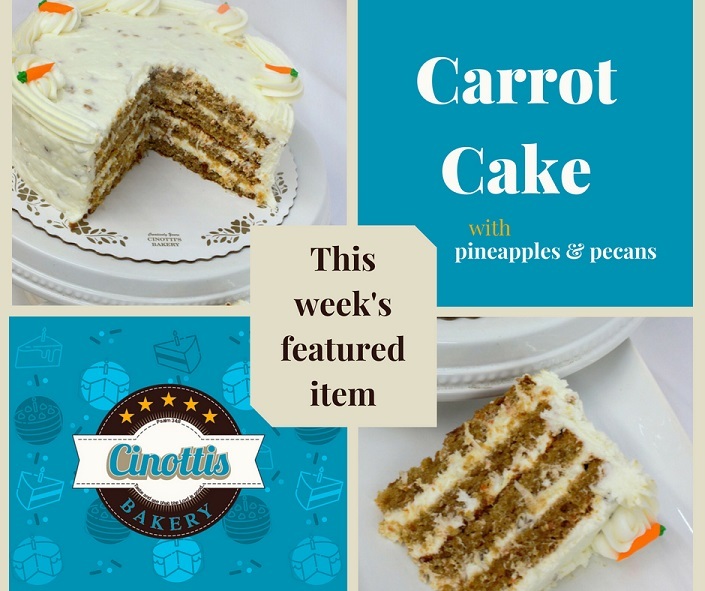 With dense layers full of carrots, pineapples, and nuts, who wouldn’t want a piece? If you’ve ever tried ours, you’ll know it’s a little different than the carrot cake formulas floating around on the internet. We’ve been baking carrot cake for over 60 years and have kept our secret formula consistent during that time. Our cake is full of freshly chopped carrots, crushed pineapples, and mini Georgia pecans. And while the cake itself is enough to make you fight for every crumb on your plate, it’s our carrot icing that has people talking. Our carrot icing is by far, our tastiest. To make our carrot icing, we first whip up a batch of cream cheese icing. We mix together large blocks of cream cheese along with shortening plus a little sugar and flavoring. Once the cream cheese icing is perfect, we add the ingredients that take our carrot cake from wow to WAZOW! We fold coconut flakes, fresh pineapples, and more pecans into the cream cheese icing. We don’t stop until we’re confident there’s enough flavor in every bite. Once the cake and icing are prepared, our decorators work to create a beautiful cake for you to enjoy. We generously spread thick layers of carrot icing between each layer of cake. With four cake layers covered in icing, our decorators cover the sides with more of the classic carrot icing. After garnishing with a cream cheese icing border and a few candied carrots, the cake is ready. The debate continues in our family whether to serve a cake cold or not. Some of us prefer cold, firmer cake. While others among us like it room temperature and soft. This topic has sparked many debates at our family dinners. If you choose to serve your carrot cake straight from the fridge, be sure to use a sharp knife when slicing. This will help keep the cake from tearing. Depending on the size of your party, you need to consider your cake size. While every family or gathering is different, we recommend our 8” cake for 12-15 servings. But we also offer carrot cake in a variety of sizes larger gatherings. 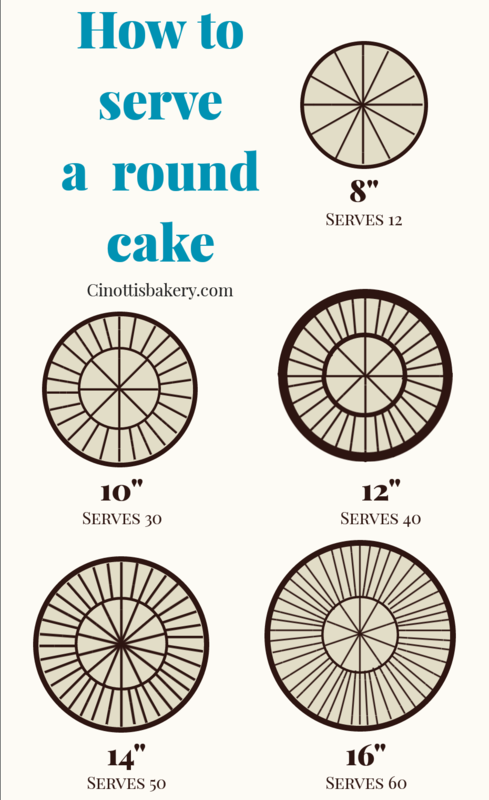 For more information on how to serve a round cake, please see our cake serving guide. Because of the cream cheese icing, carrot cake must be refrigerated after sitting out for more than an hour (less than that if it’s hot). Overwrap pieces with saran wrap to keep the icing from absorbing funky fridge smells. For frozen cake, remove pieces from freezer and allow to sit in refrigerator overnight. When pulling cake from the refrigerator, remove saran wrap and allow the cake to sit for 15 minutes. If you prefer it cold, don’t wait. Dig in right away. For more than 80 years, we’ve provided to notch baked goods to those in our community. We love the craft of baking, but perhaps what we love most is sharing our love with you. We want to be sure you get only the best from our bowls. So we’ve made it our mission to use only the highest quality ingredients and to use only NON-GMO flours. We never add any preservatives to our product and we’re always looking for healthier alternatives to heavily processed ingredients. And we will never serve your family something we wouldn’t serve to our own. We treat you like family because that’s the way it should be. 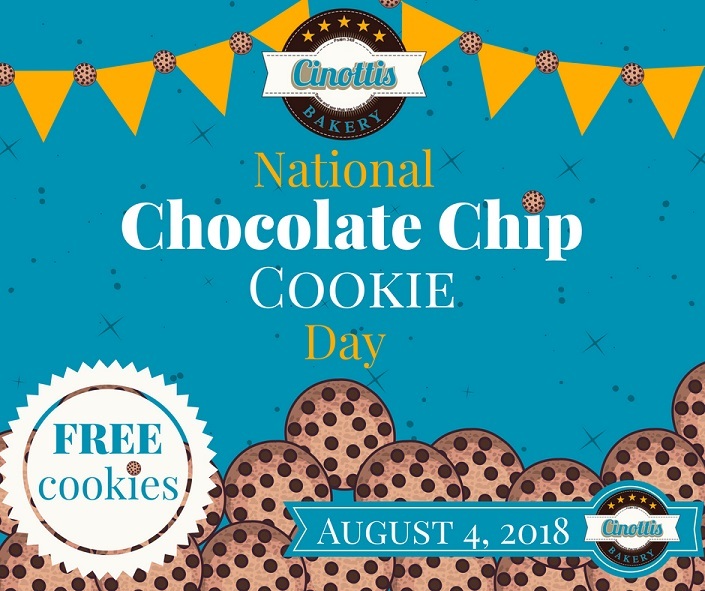 National Chocolate Chip Cookie Day-FREE Cookies! Chocolate chip cookies are perhaps the most favorite American cookie. So it’s only right that we celebrate these sweet morsels of goodness on National Chocolate Chip Cookie Day. On Saturday, August 4, 2018 we’ll be celebrating in a big way. Want A Chocolate Chip Cookie? We’ve decided to give you yet another reason to keep these cookies at the top of your favorite list. 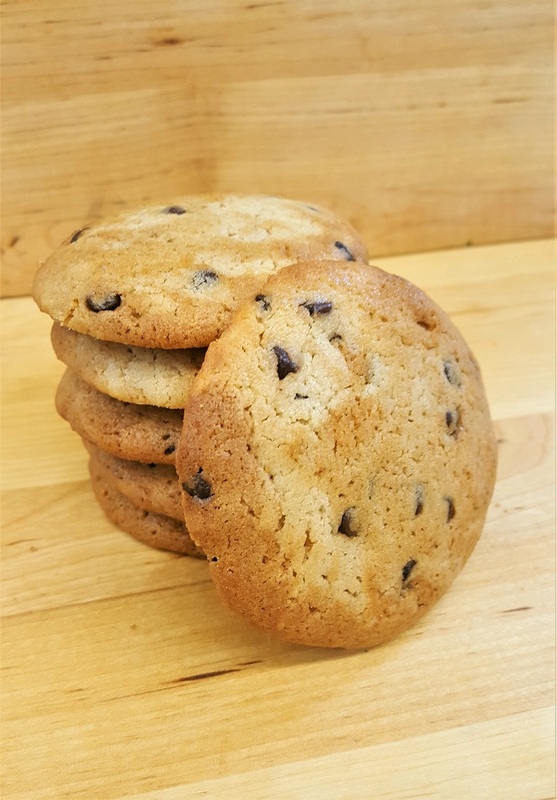 In honor of National Chocolate Chip Cookie Day, we’ll be giving away one of our delicious homemade chocolate chip cookies to every customer! So get in early and enjoy the freebie. What better way to enjoy National Chocolate Chip Cookie Day than with a couple dozen cookies from Cinottis? We’ll have dozens of chocolate chip cookies ready to go so you can spread the love with your family and friends. Or, just keep them for yourself. We won’t judge. Sometimes, the scent of cookies baking brightens even the darkest days. That’s why on National Chocolate Chip Cookie Day, we’ll be offering our frozen chocolate chip cookie balls for you to bake at home. Simply call ahead and you’ll be able to purchase a bakers’ dozen of these cookies. They’ll be pre-weighed in little balls and we’ll supply the simple baking instructions. Just think, you can get all the credit for baking yummy cookies, and all you have to do is turn on the oven! National Chocolate Chip Day is all about cookies and we love the idea of baking with family at home. We know there are tons of chocolate chip cookie formulas on the internet, but we love our cookies and we know you do too. We bake in LARGE quantities but we’ve broken our formula down to a small batch. In a second bowl, beat the shortening, granulated sugar, and brown sugar until creamy. It should take about 2- 3 minutes. Add the vanilla and eggs. Gradually beat in the flour mixture. You may have to hand mix the batter as you add the remaining flour. Fold in the chocolate chips. Let dough sit at room temperature just until it is soft enough to scoop. Scoop your desired cookie size onto prepared baking sheets. Consistency is key for even baking. Keep in mind: bigger, thicker cookies will be softer while smaller cookies will be crispier. Bake for 9-12 minutes, or until edges of cookies are golden brown. Don’t be tempted to eat them right out of the oven. You wouldn’t want to burn your mouth on those gooey chocolate chips. While our cookies are made to eat–not to keep, we understand the need to store cookies for later use. But, when cookies, like ours, have no additives or preservatives, keeping them fresh for more than a day can be challenging. Most fresh baked cookies can last up to 3 days. In that time, keep them in an airtight container free of moisture and heat. Place an apple wedge, slice of bread, or flour tortilla in the container along with your cookies. The moisture from any of these items will absorb into the cookies so you can eat them right out of the container. For warm, soft cookies, pop them into a 350° oven for three to five minutes. Enjoy a nice glass of milk while the chocolate melts in your mouth. National Chocolate Chip Cookie Day has sparked a debate on how to eat a chocolate chip cookie the right way. And, while we’re not sure there is a wrong way to eat any cookie, we’ve come up with a few ideas. How Will You Celebrate National Chocolate Chip Cookie Day? National Chocolate Chip Cookie Day is a great excuse to enjoy America’s favorite dessert. And, since we’re handing them out free on August 4, why not spend the day with us? Get your free cookie and another dozen or so to share with others. Take a couple dozen to keep in your cookie jar. Or, pick up a couple tubs of frozen dough to bake at your leisure. Share the joy of baking with your children. Bake a few batches of cookies at home and share with neighbors. Or, invite friends over to show off your magical baking powers. Any way you choose to celebrate, we hope you enjoy the sweet day with those around you. Be happy on National Chocolate Chip Cookie Day. Be sure to try the seasonal flavors! Most of you know we LOVE Christmas. We love the music. We love the smells. And, we love the cookies! That’s why we are so excited about our Christmas in July cookie week! 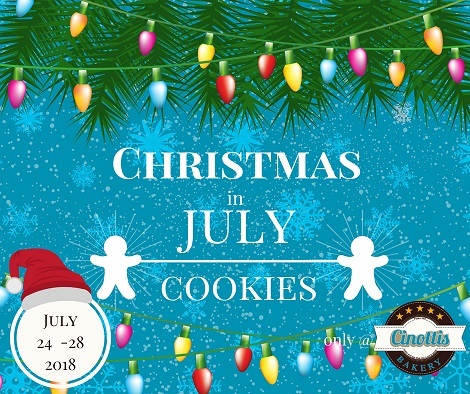 July 24th through July 28th, we will celebrate Christmas in July all over the bakery. We’ll be baking our favorite Christmas Cookies and singing Christmas carols all week long. So, clear off your counter and empty your cookie jar. With so many cute and delicious cookies to choose, we know you’ll be spreading Christmas joy all over Jacksonville. Nothing says Christmas in July better than our Iced Cutouts. Santa, Rudolph, Elves, Gingy, and many of our favorites will be available during this week. Made with our buttery sugar cookie dough, our iced cutouts are hand iced and meticulously decorated. We use a fondant-type vanilla dip that adds just the right amount of sweetness to our cookie. If you’ve never had one of our iced cutouts before, this is the week to try one. For those with a bigger sweet tooth, our Decorated Cookies are for you. Our Christmas in July selection will feature Christmas trees, Santa faces, Wreaths, and more. Made with the buttery sugar cookie dough, the decorated cookies are covered with our homemade buttercream icing. Our decorators hand pipe every element of these beautiful cookies to create a Christmas cookie worthy of the nice list. Believe it or not, Bachelor Button cookies are our number one seller all year long. So, it only makes sense that we’ll be making them during our Christmas in July week. These buttery little thumbprint cookies are filled with a fondant-like vanilla dip. While we color them in various shades for any occasion, this week, you’ll be able to get them in Christmas red and green. Keep the spirit of Christmas alive when you have them packaged in our green Christmas tree boxes. Take them to neighbors, share them with family, or keep the box for yourself. It’s okay to come back for a refill, we won’t tell Santa. What would Christmas in July week be without sugar cookies? Our hand-cut sugared Cutout cookies are the perfect treat for elves of all ages. We liberally cover each shape with colored sugar crystals before baking to perfection. Kids love to eat the sugary Christmas trees, bells, stars, and even snowmen. And, since they have less sugar than our Iced cutouts and Decorated cookies, moms love these cookies too. Cities across the world celebrate Christmas in July. In fact, July is the coldest month in Australia where they celebrate Yuletide this time of year. The festive celebrations spread across the water to other countries who now join their Aussie brethren each July. For us, though, we just love all things Christmas. Throughout the year, we collect cookie cutters for all seasons. And since July is a slower time in our store, we use the opportunity to try out these new designs and test flavors. Don’t worry. You’ll still find the original classics. But, you’ll also see some new twists on old ideas as well as new shapes for the season. We’re beyond excited to celebrate with you all. So, when you come in July 24th through July 28th, be prepared to sing along and share your Christmas spirit with the world. Because, who doesn’t love Christmas in July? 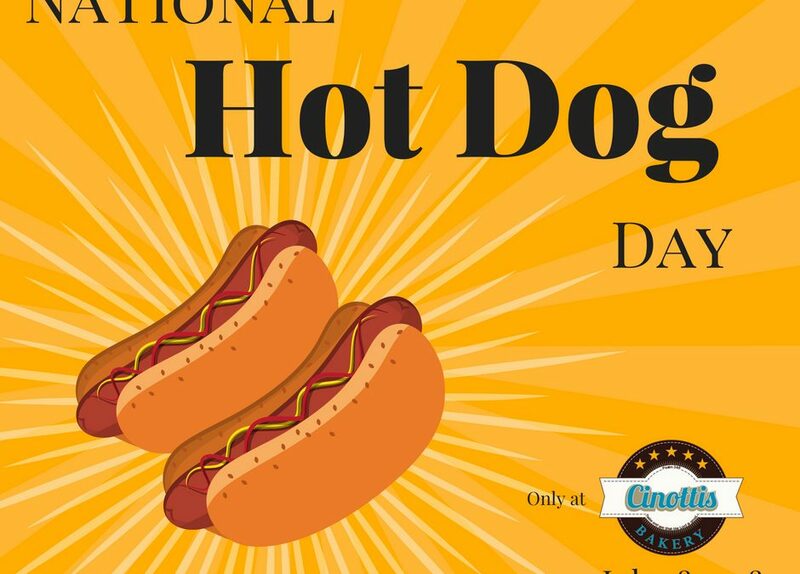 National Hot Dog Day DEALS! 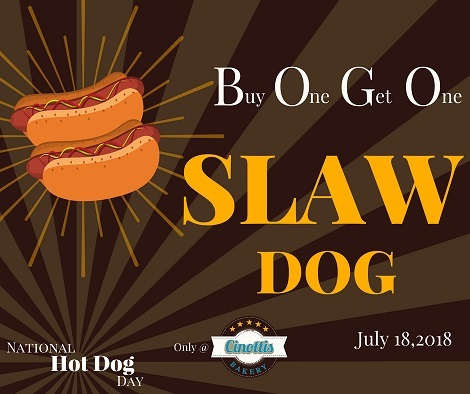 July 18th is National Hot Dog Day and we’ve got a hot deal for you. 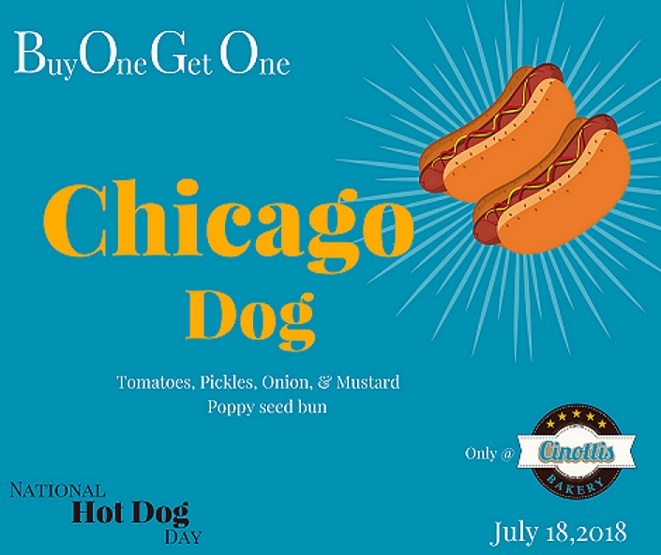 For this one day, our hot dogs will be Buy One Get One free. That’s right, two hot dogs for the price of one! And, just because it’s National Hot Dog Day, we’re not skimping on the size either. We’re giving away the same 4-ounce, all beef hot dogs you get in our sandwich shop all year long. We do have a slight twist though. While we won’t be skimping on the size, we will ADD a wide selection of toppings. We’ll also be baking up fresh buns in a variety of flavors. 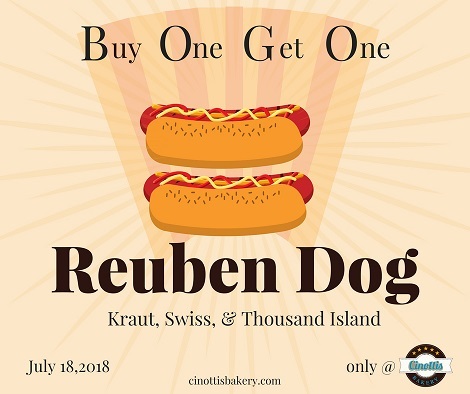 On July 18th only, you can get any of our hot dogs with any toppings for this incredible deal. Aside from our basic hot dog, in honor of this All-American holiday, we’ll be offering four premium hot dog combinations. 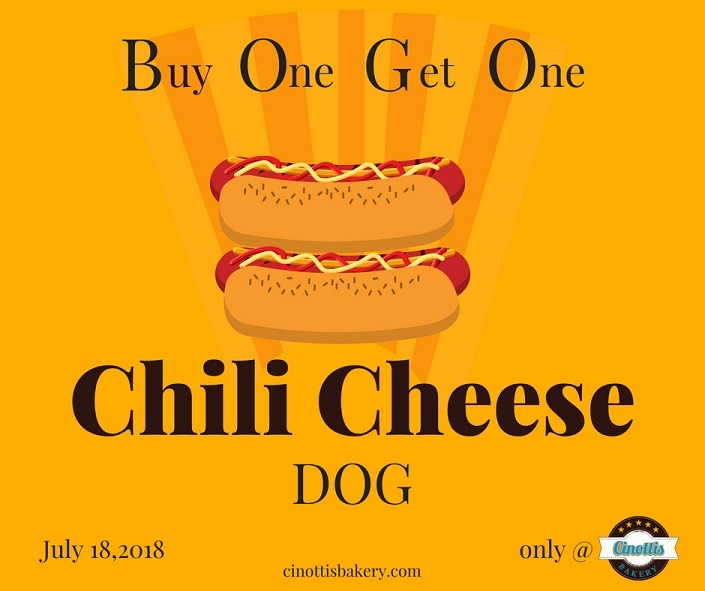 We’ll have Chili Cheese Dogs– everyone’s favorite. A Slaw Dog– the Southern classic. A Chicago Dog and a Reuben Dog. The only trouble will be deciding which one to try first. There’s nothing basic about these dogs. We use Thumann’s 4-ounce all beef hot dogs. There are no fillers or by-products so you can be sure you’re getting the very best. We only use bread baked fresh every morning in our bakery. With fresh bread and the best quality all beef hot dog, you know you’re getting the good stuff in every bite. Mayonnaise, Mustard, Ketchup, Relish, Chopped Onions, & Cheese. Of course, you can add other toppings too. On your choice of any of our freshly baked buns, we’ll pile our homemade chili over two slices of American cheese. Add onions if you’d like, we’ve got those too. Add a side of chili cheese fries to your order. Just be sure to grab a cold drink or an iced cookie to cool your taste buds. You can also check out this video on how to eat a chili dog while you wait. With the popularity of coleslaw and hot dogs, there are very few Southerners who don’t know about the Slaw Dog. Served on your choice of bun, we’ll pile our sweet slaw onto the all-beef dog. And, you can add any of the basic toppings you’d like at no extra charge. Grab a Hummingbird Cupcake to top off this truly southern delight. Our version of a Chicago style dog will be pretty close to the original. On a poppy seed bun, we’ll top these dogs with mustard, chopped onions, tomato slices and pickle spears. And don’t worry, we’ll layer them just right so you taste every element in each bite. As American as baseball and apple pie, hot dogs are Summer’s signature meal. Americans consume more than one million hot dogs on July 4th alone. So, it’s only fitting that the National Hot Dog and Sausage Council dubbed the third Wednesday in July National Hot Dog Day. While we’re not sure everyone will eat a hot dog every day this month, perhaps you could consider enjoying the iconic summer sandwich on National Hot Dog Day. Whether you spread your condiments on your bun or squirt them directly on your dog, we’re ready to celebrate with you. Swing in all day on July 18th to share in this All-American holiday. Key Lime Donuts Are Back! Summer has arrived in full force. Can you feel it? We sure can. But, nothing beats the hot Florida heat better than our refreshing Key Lime Donuts. We’ve brought our summer signature flavor back for a few short months and this year, they’re better than ever. We’ve spent the last nine months waiting for the perfect day to release our Key Lime Donuts. And, we’re happy to announce, we’re ready. Starting Friday, July 6th we’ll be creating our Key Lime Donuts for everyone. Did you know there are a ton of health benefits from key lime juice? For sure. From fighting infections, rejuvenating skin, and easing digestion, key lime juice works wonders. So, it’s easy to see why we would put it in a donut…right? As unbeneficial to health as a donut may be, the emotional effects of eating these sweet summery treats far outweighs anything bad. Take a few for yourself or take more and spread the love. Because cheering someone up with a Cinotti’s treat is never a bad idea. And, besides, our Key Lime Donuts are only here for a short time. So, they won’t affect your diet too much…will they? Made with real key lime juice and a blend of our own signature concoctions, our Key Lime Donuts are made on site from scratch every morning. We work tirelessly to create the signature flavor you’ve come to love. And, we’ve been told these Key Lime Donuts cause a Jimmy Buffet song to automatically play in people’s heads as they eat them. You can get our Key Lime Donuts starting Friday, July 6th at 6 a.m. If you’re not able to stop by Friday, don’t worry too much. We’ll be serving our delightfully refreshing (and somewhat healthy) Key Lime Donuts until September 28th. Order ahead or swing in a get a couple dozen. 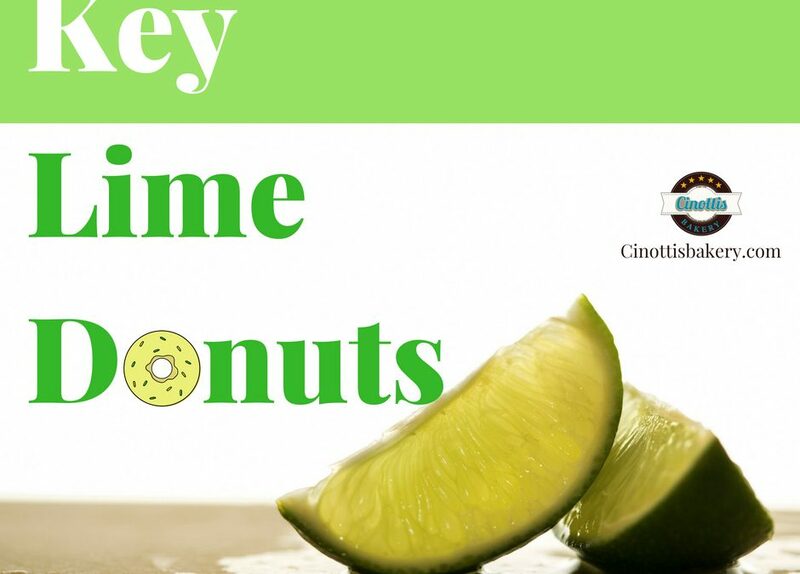 Bring the spirit of summer everywhere you go with a box of Key Lime Donuts from Cinotti’s. Most of our customers know the deep love we have for our beloved nation. This 4th of July, we will be closed a few extra days to allow our entire staff to enjoy America and all her beauty. And, while our hometown favorites won’t be available for your 4th of July celebrations, we do have a list of places and items you may find helpful. The Jacksonville Zoo and gardens is offering special priced tickets through July 8th. 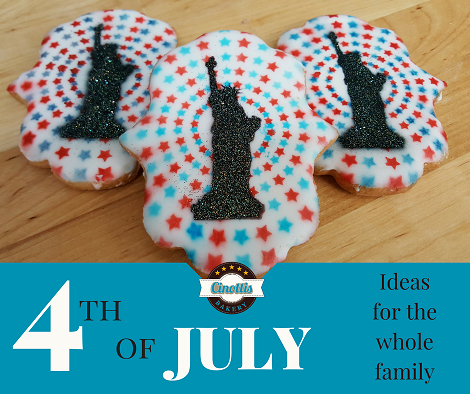 Take the entire family on the 4th of July! And, don’t forget to feed the giraffes. For indoor activities check out the Museum of Science and History downtown. MOSH is honoring America with half price admission tickets. Spend the day in the planetarium or admiring the collection of artifacts from the Roman empire. For a bit of action, head to Adventure Landing in Jacksonville Beach. They’re offering an amazing deal for the 4th of July. For only $40, you can have all the fun you want for 3 hours. Once you’ve had your fun around town, be sure to check out the local foods. These are a few of our recommendations. Culhane’s Irish Pub offers a taste of Ireland right here in Atlantic Beach. Don’t forget to try the pretzels! SunDeli has been a staple in Jacksonville Beach for over 15 years. Serving Boar’s Head meat on fresh bread will certainly keep the crowds coming. We recommend Bab’s Best. Engine 15, in Jacksonville Beach serves food everyone will love. Try the flatbreads, they’re delicious. Angies & GROM are both well-known food establishments in Jacksonville Beach. We recommend any of their subs. Salt Life Food Shack in Jacksonville Beach has some of the best desserts in town. Try their Hot Blonde or their Drunkin Sailor. You won’t be disappointed. After exploring Jacksonville and eating your weight in local food, make your way back out to the beach. Spread out a blanket and watch the fireworks light up the sky. No matter where you celebrate our Nation’s birthday, we hope you have fun and stay safe. If you’re at the beach or park, remember to clean up after yourself and fill any holes. We wish you all a very happy and safe 4th of July. As always, we’re thankful to those who have served and continue to serve our great nation. To the men and women in uniform, police, fire, and rescue workers keeping our borders and streets safe this night and every night, we thank you.